A cooling tower is an evaporative heat extraction/rejection device. 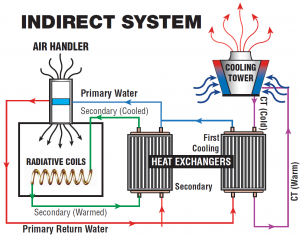 Usually the transfer uses water to move the heat out, which has been heated by an air-conditioning condenser or some type of industrial process. Instead of using air to remove heat, larger building cooling systems and industrial processes will use water evaporation to transfer heat out of the system. 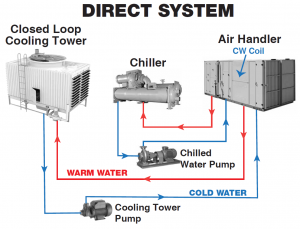 The type of system typically pairs a chiller or industrial process device with a cooling tower. Like the condenser used in your home’s central AC system, the chiller is a machine that removes heat from the building. A piped water loop runs through the building, picking up heat along the way, which is circulated though the chiller to be cooled. This is an enclosed structure, with warm water fed to a fill material (vertical surface or horizontal elements) that create an expanded air surface for heat transfer, through gravity drip that collects below in a cool water basin while allowing some of the water to evaporate. The structure must be far enough away from the tower to dissipate heat away from the tower. Pumps are used to circulate the cool water back into the system. An open cooling tower is a heat exchanger that in order to cool down water makes use of the direct contact with the air. The heat transfer occurs partially thanks to a heat exchange between air and water, but mainly thanks to the evaporation of a small quantity of the water that needs to be cooled. This will allow to cool down to a temperature lower than the ambient temperature. The heat exchange happens through the evaporation of a portion of the water that needs to be cooled. This will allow the water to cool down to a temperature lower than the ambient temperature and a delta of the high temperature point to this final temperature. Read more about direct systems here. When the water that needs to be cooled cannot be allowed to come into contact with the air (e.g. in the food industry), it is necessary to use an indirect sytem with a heat exchanger. 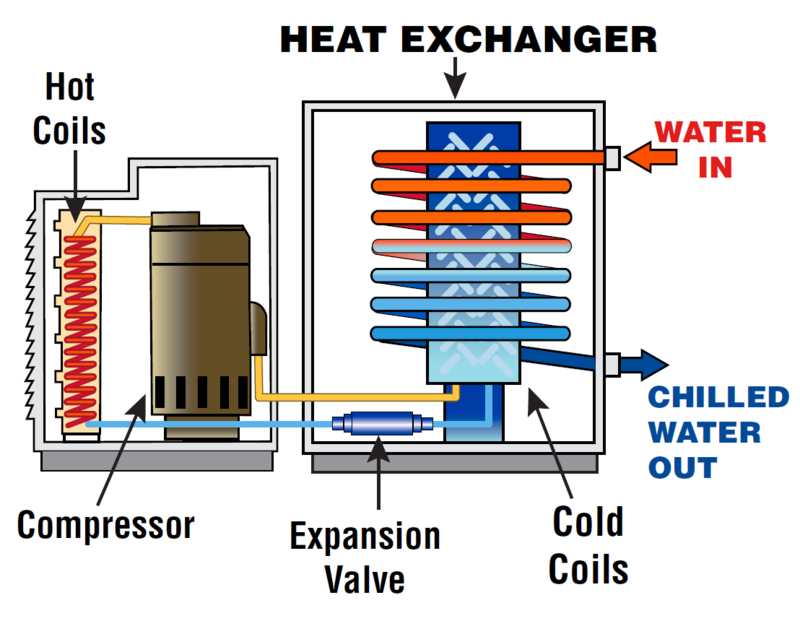 The heat exchanger separates the process water that needs to be cooled from the “evaporation water” of the cooling tower. This will avoid contact between the process water and the air. For starters, as the name suggests, there is no direct contact of air and water in this closed system. A dual fluid system transfers heat through the walls of coiled tubes or radiators to the secondary fluid which is circulated to evaporative cooling and recycled back to the system after being cooled. Counterflow (air flows vertically upward) and Crossflow (water flows vertically through the fill while the air flows horizontally). These different configurations can be further identified by the fan type, shape, water flow or efficiency. Read more about indirect systems here. This circuit would consist of two types of cooling and would use both dry (air) plus evaporation (wet) in some manner. The cooling can be achieved through either natural or mechanical draft with fans. 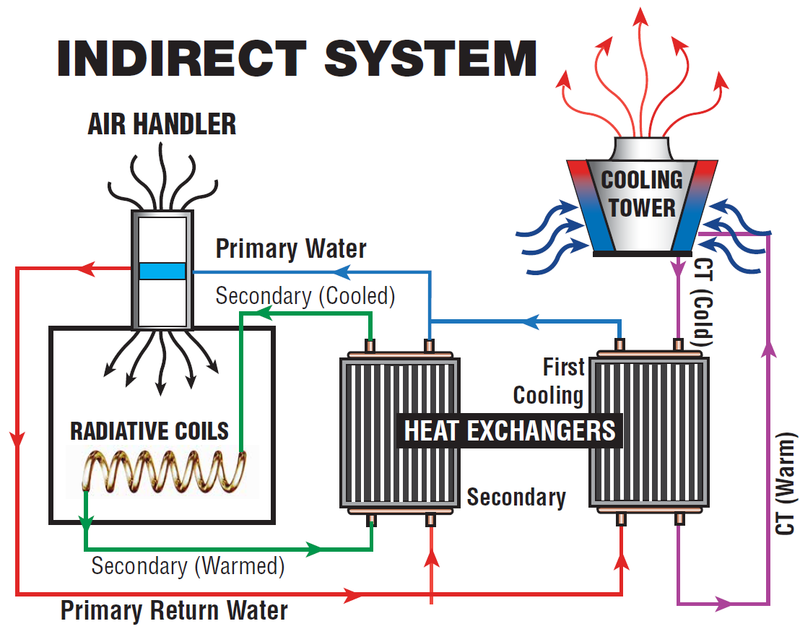 Cooling towers may either use the evaporation of water to remove process heat or rely solely on air to cool the working fluid to near the dry-bulb air temperature. A cooling tower may account for 3/4 or more of the water use in a commercial building. Evaporation takes away pure water, leaving behind the minerals. This requires constant dumping and replenishing of water to keep the system mineral content at an acceptable level so as to prevent scaling. Scale inhibitors are used in some systems, but accurately measuring both the quality and levels of the system are absolutely critical to be able to both properly maintain the system and for improved water use efficiency and heat transfer efficiency. Scale formation, even in the slightest of forms can drastically reduce the heat transfer efficiency of these systems. An integral and essential part of this is controlling the water levels using the right product. This is where Waterline Controls can help you with its proven accuracy and reliability. Call or email us today for more information 888-905-1892 or info@waterlinecontrols.com.